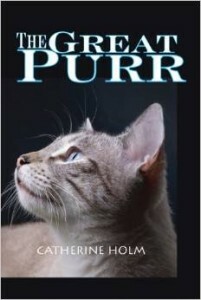 The latest from author Catherine Holm is The Great Purr, recently a Cat Writer Association 2014 nominee for Book: Fiction, is available now. Cat Holm loves writing about, working for, and living with cats. She is the author of literary short story collections My Heart is a Mountain and Voice Lessons:Tales of Breaking Free, the cat-themed memoir Driving with Cats: Ours for a Short Time, and the cat fantasy fiction novel The Great Purr. She is the creator of Ann Catanzaro cat fantasy story gift books. She loves to dance, be outside whenever possible, read, play with cats, make music, do and teach yoga, and write. Cat lives in the woods, which she loves as much as really dark chocolate, and gets regular inspiration shots along with her double espresso shots from the city. In a northern Minnesota mining town, cats have always maintained the Great Purr, a force that holds the Real World, the UnderEarth, and the Spirit World together. But when the Great Purr becomes corrupted and threatens to destroy the world, the magical cats of Ironton must work together to prevent disaster. Can Karma use her exquisite sensitivity without it destroying her? Will Target harness his gift of focus at the right time? And will sensual Kali be able to resist the temptation of the Evil that threatens to unravel The Great Purr?